Sound & Lighting control room (known as the booth in the USA) is at the rear of the auditorium. The projection equipment that used to be in the room below it has been removed, and this area is now used to mix live sound (so that the sound operator is able to hear what the audience can hear). Auditorium: 460 seats, all on a gentle rake. There are vomitory entrances stage left and stage right which lead to the foyer. Stage: At the same level as the front row of the audience. 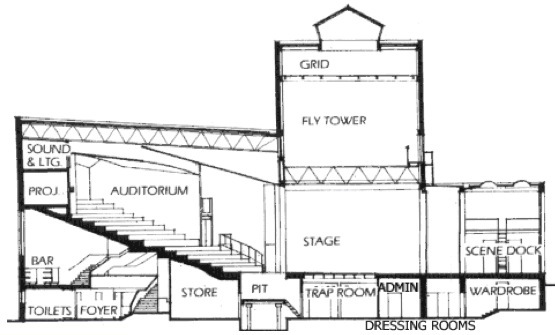 Fly Tower (also known as the Fly Loft in the US): Above the stage, with a system known as double purchase counterweight flying. The pulleys for the flying system are mounted onto the Grid at the top of the fly tower. The Scene Dock at the rear of the stage is where lorries and vans unload set and props, which can then be stored or moved through to the stage, all on the same level. There are offices for stage management and technical crew in this area too. The bar, public toilets and foyer are all underneath the auditorium. Recently a passenger elevator has been added to ensure guests with mobility problems can access all parts of the auditorium in comfort. The pit is an elevator which usually is positioned at stage level. The elevator can be lowered to form an orchestra pit which members of the orchestra can access from the Trap Room below the stage. The pit drops down to the level of the store so that pianos, timpani drums etc can easily be wheeled onto it. There are also offices for administrative staff and dressing rooms under the stage, along with a company manager’s office, and a wardrobe workroom and laundry facility.